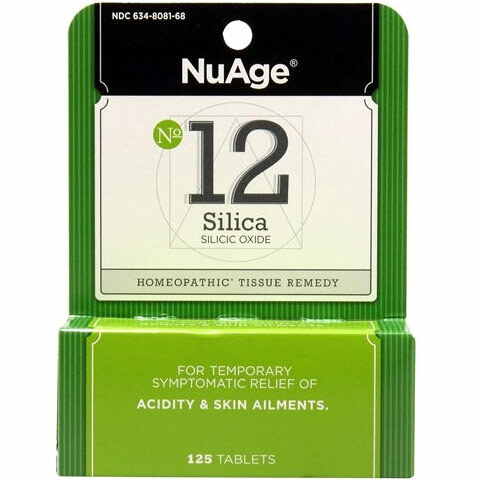 NuAge Tissue Salts – Silica Homeopathic Tissue Remedy For the temporary symptomatic relief of the symptoms of Acidity, Skin Ailments. SILICA (Silicea) is a natural cleanser and eliminator. It can often initiate the healing process by prompting suppuration and breaking up accumulations. Boils, pus formations, brittle nails, lackluster nails, weak hair, and offensive perspiration of the feet and armpits are all indications for Silica. Symptoms are generally worse at the beginning and end of the day, with cold, from washing and during menstruation, and better from heat and humid wet weather. Silica is specifically useful for: Acidity – gastric disturbances, irritations of the skin and mucous membranes, twinges of rheumatism, headaches and a persistent feeling of tiredness, all as symptoms of acidity. Silica may be indicated by an upset stomach with gas, heartburn and chilliness. Skin Ailments – Silica maybe indicated in abscesses, boils, and any other skin conditions with thick, yellow discharges. NuAge Silica Ingredients: Silica 6X HPUS in a base of Lactose NF. Suggested Use: Adults & children over 6 years of age: 4 tablets. Children (ages 1 to 6): 2 tablets. Dissolve under tongue 3 times a day. Use more frequently (every 15 mins. for 8 doses) with acute conditions. Caution: Pregnant or lactating women, diabetics, hypoglycemics, and people with known medical conditions and/or taking drugs should consult with a licensed physician and/or pharmacist prior to taking dietary supplements. NuAge Tissue Salts – Natrum Sulph Homeopathic Tissue Remedy For the temporary symptomatic relief of the symptoms of Constipation, Headaches, Sciatica. Natrum Sulph (Natrum Sulphuricum) is effective in eliminating excess water. It is the principal remedy in influenza. Tiredness from humidity and rheumatism are other indications for Natrum Sulph. Symptoms are worse with humidity and better with pressure and dry weather. 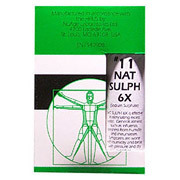 Natrum Sulph is specifically useful for the symptoms of: CONSTIPATION – difficult or deficient movements of the bowels. Natrum Sulph is the remedy of choice in chronic constipation with difficulty in passing stool. HEADACHES are one of the most commonplace of human ailments. Migraines and sick headaches with nausea and a bitter taste in the mouth that are worse in damp warm weather can be relieved with Natrum Sulph. SCIATICA is an inflammation of the great sciatic nerve which runs down the back of the thigh. It can follow as a result of exposure to cold and dampness, causing irritation of the nerve. Pressure from other causes may also be responsible for the sciatic pain. When the pain comes with rising from a sitting position or turning in bed and no position is comfortable, Natrum Sulph may be the remedy of choice. NuAge Nat Sulph Ingredients: Natrum Sulphuricum 6X HPUS in a base of Lactose NF. Suggested Use: Adults & children over 6 years of age: 4 tablets. Children (ages 1 to 6): 2 tablets. Dissolve under tongue 3 times a day. Use more frequently (every 15 mins. for 8 doses) with acute conditions. Caution: Pregnant or lactating women, diabetics, hypoglycemics, and people with known medical conditions and/or taking drugs should consult with a licensed physician and/or pharmacist prior to taking dietary supplements. NuAge Tissue Salts – Natrum Phos Homeopathic Tissue Remedy For the temporary symptomatic relief of symptoms of Acidity, Diarrhea, Headaches. A deficiency of Natrum Phos (Natrum Phosphoricum) often causes stiffness and swelling in the tissues around the joints. This remedy often relieves diarrhea, colic, vomiting, sleeplessness and fever due to acid conditions of the stomach. General acidity, digestive upsets and heartburn along with rheumatism and back pain are indication for the remedy Natrum Phos. Symptoms are generally worse with exertion and better with rest. Natrum Phos is specifically useful for the symptoms of : Acidity – There may be gastric disturbances, irritation of the skin and mucous membranes, twinges of rheumatism, headaches and a persistent feeling of tiredness, all symptoms of acidity. Diarrhea of teething children with sour smelling, greenish stools. Headaches on the crown of the head on awakening and sick headaches with acid symptoms, especially after wine or milk are symptoms of Natrum Phos. NuAge Nat Phos Ingredients: Natrum Phosphoricum 6X HPUS in a base of Lactose NF. Suggested Use: Adults & children over 6 years of age: 4 tablets. Children (ages 1 to 6): 2 tablets. Dissolve under tongue 3 times a day. Use more frequently (every 15 mins. for 8 doses) with acute conditions. Caution: Pregnant or lactating women, diabetics, hypoglycemics, and people with known medical conditions and/or taking drugs should consult with a licensed physician and/or pharmacist prior to taking dietary supplements. NuAge Tissue Salts – Natrum Mur Homeopathic Tissue Remedy For the temporary symptomatic relief of the symptoms of Colds, Headaches, Bed Wetting. Natrum Mur (Natrum Muriaticum) acts with the body to redistribute water. Excessive moisture or dryness in any part of the body is a clear indication of a Natrum Mur deficiency. Running watery colds with loss of smell of taste, painful nose and throat symptoms, hay fever, heartburn, headaches, low spirits, hangovers and constipation are all indications that may be relieved by Natrum Mur Symptoms are generally worse with noise, mental exertion and heat and better with open air and cool bathing. Natrum Mur is specifically useful for: Colds with symptoms of thin, watery runny nose. Sometimes the Natrum Mur cold is accompanied by violent sneezing and weakness. Headaches – Although many different types of headaches are common, the symptoms of throbbing, blinding headaches that feel as if little hammers are pounding on the head are often relieved by Natrum Mur. Bed Wetting – is a fairly common habit with some young children. It may be due to nervousness, indigestion, too much liquid before retiring or just a habit. Bed wetting that is accompanied by acid stomach symptoms may be relieved with Natrum Mur. NuAge Natrum Mur Ingredients: Natrum Muriaticum 6X HPUS in a base of Lactose NF. Suggested Use: Adults & children over 6 years of age: 4 tablets. Children (ages 1 to 6): 2 tablets. Dissolve under tongue 3 times a day. Use more frequently (every 15 mins. for 8 doses) with acute conditions. Caution: Pregnant or lactating women, diabetics, hypoglycemics, and people with known medical conditions and/or taking drugs should consult with a licensed physician and/or pharmacist prior to taking dietary supplements. 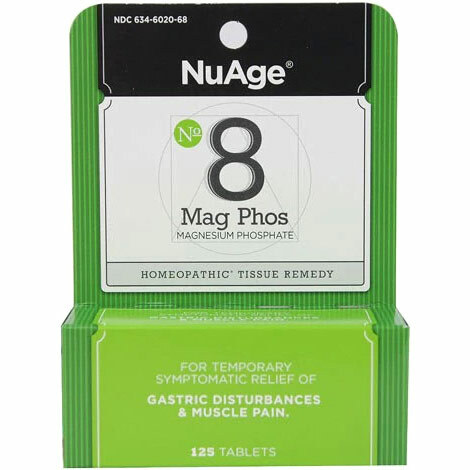 NuAge Tissue Salts – Mag Phos Homeopathic Tissue Remedy For the temporary symptomatic relief of the symptoms of Gastric Disturbances, Muscle Pain. MAG PHOS (Magnesia Phosphorica) is indicated for relief of symptoms of nerve pains, like sciatica and headaches, accompanied by shooting, darting stabs of pain. Muscular twitching, cramps, muscle strains, hiccups, convulsive fits of coughing and flatulence are all indications for MAG PHOS. It also relieves menstrual pains and stomach aches. Symptoms are often worse from cold and touch and better with pressure, rubbing, warmth and bending double. MAG PHOS is specifically useful for: GASTRIC DISTURBANCES including a wide range of ailments characterized by painful or uncomfortable symptoms associated with the function of digestion. MAG PHOS is indicated with a feeling of gas with flatulence and belching or spasmodic pains and cramps of the stomach that are relieved with hot drinks. MUSCLE PAIN – MAG PHOS is the tissue remedy to consider for relief of symptoms of cramping or spasmodic pains with an acute stabbing, boring sensation similar to those experienced with sciatica and menstruation. NuAge Mag Phos Ingredients: Magnesia Phosphorica 6X HPUS in a base of Lactose NF. Suggested Use: Adults & children over 6 years of age: 4 tablets. Children (ages 1 to 6): 2 tablets. Dissolve under tongue 3 times a day. Use more frequently (every 15 mins. for 8 doses) with acute conditions. Caution: Pregnant or lactating women, diabetics, hypoglycemics, and people with known medical conditions and/or taking drugs should consult with a licensed physician and/or pharmacist prior to taking dietary supplements. NuAge Tissue Salts – Kali Sulph Homeopathic Tissue Remedy For the temporary symptomatic relief of the symptoms of Cough, Earache, Sinus Congestion. KALI SULPH (Kali Sulphuricum) is indicated anytime there is a sticky, yellowish discharge frtom the skin or mucous membranes. Skin and scalp eruptions with scaling call for this remedy. Symptoms are generally worse in the evening and better in fresh air. KALI SULPH is specifically useful for the relief of symptoms of: COUGHS – with yellow expectoration that are worse in a heated room and in the evening. – the distressing earaches of children. SINUS – sticky, yellow or greenish discharge from the sinuses is an indication that may be relieved by the remedy KALI SULPH. NuAge Kali Sulph Ingredients: Kali Sulphuricum 6X HPUS in a base of Lactose NF. Suggested Use: Adults & children over 6 years of age: 4 tablets. Children (ages 1 to 6): 2 tablets. Dissolve under tongue 3 times a day. Use more frequently (every 15 mins. for 8 doses) with acute conditions. Caution: Pregnant or lactating women, diabetics, hypoglycemics, and people with known medical conditions and/or taking drugs should consult with a licensed physician and/or pharmacist prior to taking dietary supplements. NuAge Tissue Salts – Kali Phos Homeopathic Tissue Remedy For the temporary symptomatic relief of the symptoms of Bed Wetting, Sciatica, Sleeplessness. Kali Phos (Kali Phosphoricum) is a nerve nutrient. Nervous exhaustion, nervous indigestion, nervous headaches,skin problems brought on by anxiety and the many other ailments that can be associated with stress are all indications that may be relieved by KALI PHOS. Symptoms are generally worse from mental and physical exertion and cold and better with rest and warmth. KALI PHOS is specifically useful for: BED WETTING is a fairly common habit with some young children. It may be due to nervousness, indigestion, too much liquid before retiring or just a habit. KALI PHOS is the principal remedy to consider for relief of symptoms of nervous, highly strung children. NERVES – KALI PHOS is the principal nerve tissue remedy; the nerve nutrient and revitalizer which should be given in ailments of a nervous character. It is the remedy when the nerves are said to be "on edge". SCIATICA is an inflammation of the great sciatic nerve that runs down the back of the thigh. It can follow a as a result of exposure to cold and dampness, causing irritation of the nerve. SLEEPLESSNESS – KALI PHOS is the principal remedy relief of symptoms of sleeplessness from nervous causes or due to over-excitement. NuAge Kali Phos Ingredients: Kali Phosphoricum 6X HPUS in a base of Lactose NF. Suggested Use: Adults & children over 6 years of age: 4 tablets. Children (ages 1 to 6): 2 tablets. Use more frequently (every 15 mins. for 8 doses) with acute conditions. Caution: Pregnant or lactating women, diabetics, hypoglycemics, and people with known medical conditions and/or taking drugs should consult with a licensed physician and/or pharmacist prior to taking dietary supplements. NuAge Tissue Salts – Kali Mur Homeopathic Tissue Remedy For the temporary symptomatic relief of the symptoms of Coughs, Eye Irritation, Skin Ailments. KALI MUR (Kali Muriaticum) is the remedy for relief of symptoms of sluggish conditions and symptoms affecting the mucous membranes with thick, white discharges: coughs, colds, sore throats and catarrh. This tissue salt is useful as a first aid treatment for burns. Symptoms may be worse with motion and after eating fatty or rich foods. KALI MUR is specifically useful for the symptoms of: COUGHS- children’s coughs, with white coated tongue and white phlegm can be relieved with the tissue remedy KALI MUR. Eyes- eye irritation with whitish discharge. SKIN AILMENTS are a large and important group which influence the general health. KALI MUR is an effective tissue remedy relief of symptoms of the second stages of inflammatory conditions. Thick, white eruptions accompanied by a white coated tongue are indications for KALI MUR. NuAge Kali Mur Ingredients: Kali Muriaticum 6X HPUS in a base of Lactose NF. Suggested Use: Adults & children over 6 years of age: 4 tablets. Children (ages 1 to 6): 2 tablets. Dissolve under tongue 3 times a day. Use more frequently (every 15 mins. for 8 doses) with acute conditions. Caution: Pregnant or lactating women, diabetics, hypoglycemics, and people with known medical conditions and/or taking drugs should consult with a licensed physician and/or pharmacist prior to taking dietary supplements. NuAge Tissue Salts – Ferrum Phos Homeopathic Tissue Remedy For the temporary relief of the symptoms of Colds, Fevers & Inflammation, Headaches. FERRUM PHOS (Ferrum Phosphoricum) is the pre-eminent first aid remedy. FERRUM PHOS can be given with advantage in the early stage of most acute disorders. It is an excellent remedy for relief of symptoms of ailments associated with advancing years and childhood ailments. Congestion, inflammatory pain, fevers, headaches and other symptoms appearing in the early stages of most ailments are all indications for FERRUM PHOS. Symptoms are worse at night and with motion and better with cold applications. FERRUM PHOS is specifically useful for the relief of symptoms of: COLDS – with sneezing, feverishness, stuffiness. FEVER & INFLAMMATION – this is the first remedy indicated in all types of symptoms of fever and inflammation. Rapid pulse, flushed face, vomiting of undigested food and a chilly sensation are all symptoms of fevers relieved by FERRUM PHOS. HEADACHES – inflammatory headaches (from cold or heat from the sun) with throbbing in the temples or over the eyes. Congestive headaches during the menstrual period. NuAge Ferrum Phos Ingredients: Ferrum Phosphoricum 6X HPUS in a base of Lactose NF. Suggested Use: Adults & children over 6 years of age: 4 tablets. Children (ages 1 to 6): 2 tablets. Dissolve under tongue 3 times a day. Use more frequently (every 15 mins. for 8 doses) with acute conditions. Caution: Pregnant or lactating women, diabetics, hypoglycemics, and people with known medical conditions and/or taking drugs should consult with a licensed physician and/or pharmacist prior to taking dietary supplements. NuAge Tissue Salts – Calc Sulph Homeopathic Tissue Remedy For the temporary symptomatic relief of the symptoms of Coughs, Skin Ailments, Sore Throat, Colds, Toothache. Calc Sulph (Calcarea Sulphurica) has a cleansing and purifying influence throughout the system. Minor skin ailments, acne, and pimples during adolescence and sore throats are all indications for Calc Sulph. Symptoms are generally worse after getting wet and better in a warm, dry atmosphere. Calc Sulph is specifically useful for relief of symptoms of: Coughs – when the cough is loose and rattling with expectoration of thin, watery phlegm. Skin Ailments – where there are thick yellow discharges and yellowish scabs. Sore Throats – with irritation, coughing and general discomfort. Colds – if taken in the early stages can prevent further development of a cold. Toothache – for toothache with sore swollen gums that bleed on brushing. Do not take this product for persistent or chronic cough such as occurs with smoking, asthma or emphysema, or if cough is accompanied by excessive phlegm (mucous) unless directed by a doctor. NuAge Calc Sulph Ingredients: Calcarea Sulphurica 6X HPUS in a base of Lactose NF. Suggested Use: Adults and children over 6 years of age: 4 tablets. Children: (ages1 to 6): 2 tablets. Dissolve under tongue 3 times a day. Use more frequently (every 15 minutes for 8 doses) with acute conditions. Caution: Pregnant or lactating women, diabetics, hypoglycemics, and people with known medical conditions and/or taking drugs should consult with a licensed physician and/or pharmacist prior to taking dietary supplements. You are currently browsing the archives for the Homeopathic Remedies category.